Sainsbury's Supermarket located in the centre of the town. Largest supermarket in the town which is connected to Beales department store. 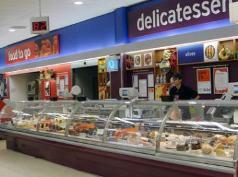 Offering a wide range of fresh products, frozen food and also offering home ware and clothes. All the big brands available at Sainsbury's. Get cash out from the Sainsbury's cash machines or have a coffee in the connected Starbucks. Large car park at the front and rear. Petrol station offering competitively priced fuel.